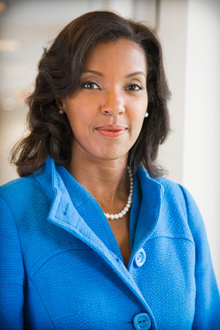 Erika Hayes James has been named dean of Goizueta Business School, beginning July 15. Photo by Jim Carpenter. Emory University Provost Claire Sterk announced that Erika Hayes James, PhD, has been appointed dean of the university's Goizueta Business School. James will assume her new role on July 15. She comes to Emory from the Darden Graduate School of Business Administration at the University of Virginia, where she served most recently as senior associate dean for executive education. Emory’s business school, founded 95 years ago, was honored to take its current name in 1994 from Roberto C. Goizueta, the innovative and influential business leader who served as chair and CEO of The Coca-Cola Company from 1981 until his death in 1997. Central to his vision and the school’s mission are excellence and principled leadership, which set Goizueta apart from others and greatly impact the experience of students and the curriculum. "I am sure our father would consider Erika James to be an inspired choice, given their shared interest in innovative teaching and learning, and developing business leaders who are committed to excellence and integrity," says Olga Goizueta Rawls, chair and CEO of The Goizueta Foundation. "We are anticipating even greater successes for the Goizueta Business School and its graduates under her leadership." Goizueta offers undergraduate and graduate degrees, including a bachelor’s in business administration (BBA), a one- and two-year full-time MBA, an evening MBA, an executive MBA, a PhD in business, and joint degrees with several of Emory’s academic units. The full-time MBA program at Goizueta is ranked No. 1 by Bloomberg Business Week for job placement, and four of the school’s degree programs rank in the top 25. Bloomberg consistently ranks the BBA program at Goizueta among the top 10 undergraduate programs. The school places a priority on its accessible, world-class faculty, who foster an intimate learning experience for students. Given the significant corporate and business presences and resources in Atlanta, Goizueta is positioned well for corporate partnerships, entrepreneurial activities and other collaborations with industry. James hopes to deepen the connections between Goizueta and Atlanta’s business community, nonprofit organizations and other universities. “I see a real opportunity to align business thought leadership in Atlanta and, in the tradition of the academy, to bring research to bear on challenges," says James. She also sees opportunities to bring Goizueta’s business acumen together with Emory’s health care expertise to address the enormous national challenges facing health care delivery systems. With a PhD in organizational psychology from the University of Michigan, James works at the intersection of organizational psychology and executive leadership. In addition to her scholarly work in crisis leadership, James is an expert in executive leadership and academic administration. As an educator, she has received accolades from MBA students at both Darden and Harvard Business School, where she served as a visiting professor. As a consultant to Fortune 500 clients, she has helped executives lead their organizations by developing skills in decision-making under pressure, seizing opportunities in crises and managing the change process afterwards, and promoting workplace diversity. A comprehensive process, led by the search firm Heidrick and Struggles, identified a dynamic and experienced group of candidates for the Goizueta dean from an international pool, and a search advisory committee at Emory—chaired by Linda McCauley, dean of the Nell Hodgson Woodruff School of Nursing—helped narrow the field of candidates. Finalists met with leaders and key constituents throughout Emory this spring.